I have been a resident of Needham Massachusetts since 1987, I reside there with my wife Nancy, and feel very connected to the community where we raised our 3 children: Matt, Shelby and Davis. As my children were growing up in Needham, I decided to put my energies into giving back to the community through youth sports. I coached for Needham Youth Lacrosse, and directed the program from its infancy, and developed it for 12 years. My son Matt, Ithaca College 09, is a Wealth Managment Advisor with Northwestern Mutual in the Wellesley, MA agency. Matt is married and we are thrilled to welcome our first granddaughter. My daughter Shelby after graduating from UNION COLLEGE '11, did a Fellowship in Ecuador with the Yanapuma Foundation. She has been employed with Hologic in the Boston area, for over 7 years. Both Matt and Shelby played lacrosse for their college teams. Shelby ran her first Marathon in Maine in May 2015. My youngest son Davis, played soccer and lacrosse in high school, and graduated UNION COLLEGE in June 2015. He was awarded a Fellowship to work in the textile industry as a Business Manager in Bagru, India for a year. He is now stateside and working for a startup. My personal passion is cycling. I am one of the founding members of the HPG Biking Club. I have been cycling for over 30 years now, and I do not go many places WITHOUT my bike! 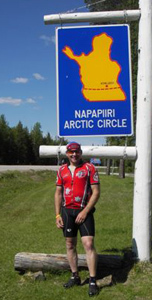 My adventures have taken me to many beautiful places in the United States, along with trips to Majorca, Spain and to Finland where we cycled the country ending up at the Arctic Circle. I have enjoyed 2 bike trip to the Blue Ridge Mountains in North Carolina. Last year's adventure took me to Israel where I biked for the Arava Institute and pedaled from Jerusalem to Eilat! Looking forward to where my next bike excursion will be! I have used my cycling abilities to raise money for various causes. I participated in the Pan Mass Challenge for 18 years, and I have done the MS Bike & Hike the Berkshires for 5 years. I also completed the Boston Marathon for the Dana Farber Cancer Institute, where I was paired with a family who had lost a loved one recently. Most recently was The Israel Ride www.israelride.org raising money for the Arava Institute. It gives me great pride in knowing that I can use my athletic ability to give back, and also raise a lot of money for these great causes. My wife Nancy and I founded and ran the Needham Youth lacrosse Program and headed the program for 7 years. My passion for lacrosse dates back to my college days of playing lacrosse at ithaca College. If I'm not with my family, you can find me on my bike, walking in the woods, or playing golf. I am a member of the Needham Golf Club, and am always looking for tips to improve my golf game.